From the fourth round of island explorations. Click here for an overview of current Faction standings, including Military power. Having placed third and fourth in the great tournament, the Shadow Isles and the Freljord have been granted joint authority to investigate the island of Krocylea, southeast of Nyroth’s mainland. 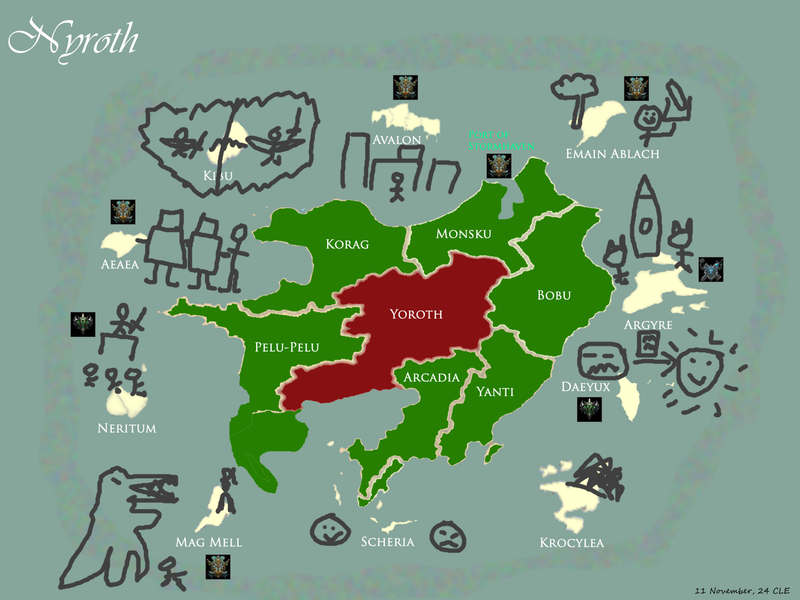 When shown a map of present-day Nyroth, the ancient Nyrothian reacted with confusion to the image of Krocylea. He frowned, as though doubting himself, then shook his head and scribbled out half of the island. Subsequent consultation of older maps held by the Nyrothians in their floating city above Yoroth revealed that the shape of Krocylea had changed since the cataclysm: it had been transformed into a mirror image of Argyre. Preliminary scouting reports discovered two civilizations on Krocylea. Their capital cities were mirror images of one another, and they were in a constant state of border war along the center line of the island. None of the natives seemed to have any idea what had begun the conflict, only that it had been going for longer than even the inhabitants’ legends could recall. Both monarchs were willing to aid the Valoranians in exchange for the annihilation of their rival kingdom. They seemed interested in little else. There was no ideological clash that they could define, nor any other rationale that would explain such interminable conflict. The continued existence of the other civilization seemed to pain them deeply, grating on their minds like nails over slate. Such symmetric bonds are not unheard of in the arcane science of Valoran, but the League’s archives contained no mention of any phenomenon so enduring on such a large scale. The Summoners theorized that the psychic resonance between the two civilizations could manifest as an irrational, destructive obsession with one another. When the representatives of the Freljord and the Shadow Isles met and exchanged findings, they discovered further signs of symmetry. Most surprisingly, in terms of physical appearance and demeanor, both monarchs appeared to be exact duplicates of one another. Indeed, many of the court functionaries of each kingdom appeared to have duplicates in the other court, in the same or similar positions. Through the use of a Clairvoyance spell, the Summoners confirmed that most of those on the island had a twin in the opposing kingdom. Locating the island’s nexus was not difficult. It lay, as expected, precisely between the two kingdoms, surrounded by the crumbling ruins of an ancient Nyrothian city. The two warring kingdoms fought especially fiercely around this point, but neither seemed able to establish a secure foothold. Dangerous discharges of wild magic prevented either side from setting up camp within the walls. When asked, both sides accused the other of being a nefarious magical construct, a representation of their own inner evil. They said they were attempting to seize the nexus and neutralize it to destroy their adversary, but that so long as the other side’s mages were working against them it proved impossible to find the solution to stabilize it. Both the Freljord and the Shadow Isles must decide how to proceed. Their decisions are, appropriately enough, symmetrical. Each mirror-kingdom has offered its respective Valoranian faction an alliance, conditional upon its aid in the destruction of its rival. Do you want to help “your” kingdom destroy the other kingdom, or try to fix the nexus (which may mean fighting both of them)? If it comes down to it, are you willing to fight the other faction? (If so, there will be special battle matches on Thursday evening, beginning at 6 Pacific. Each army is of Epic Strength (60), and (of course) of identical configuration. Summaries of current Military power. The Krocyleans will add 60 Strength to each side. Champions add about 15 Strength each. Lissandra and Sejuani are the Freljord’s best tacticians, and at least one should probably be brought if the Freljord’s planning any epic battles. If, in any given round, either side has a total Strength greater than 150% of the other side’s Strength, the stronger side wins and the other side is forced to retreat.If the two sides do come to blows, we will hold a set of three matches on Thursday, beginning at 6 p.m. Pacific time. If the victor goes 2–1, they will gain a +25% Strength modifier in the combat; that increases to +50% if they go 3–0. Bilgewater Summoners will be allowed to sub in freely for Shadow Isles Summoners, and likewise for Ionian Summoners and the Freljord. (Standard SI and Freljord Champion lists will be used. One exception: if an ally faction sends Champions, those Champions will be temporarily added to the list for these matches. e.g., if Bilgewater sends Graves to help SI, SI can pick Graves.) Consider this post notice to get ready for Thursday. (The Strength bonus extends to NPC allies. They’re the minions. )There is a serious danger here that the Shadow Isles and the Freljord may end up in a clash of arms. The League would frown upon this, but (provided the conflict is resolved quickly) will not issue sanctions or intervene. Bilgewater and Ionia will have an opportunity to offer military and naval support. It is worth noting that Bilgewater and the Shadow Isles have a significantly larger military than Ionia and the Freljord. It is worth noting that the Shadow Isles fights on an “all or nothing” basis: its defeated units are generally lost (rather than retreating), but if it wins a battle it raises a third of the enemy’s units as undead. If the Freljord and the Shadow Isles end up on the same side as one another, and win together, they’ll split rewards 50/50. If either accepts help from Bilgewater or Ionia, they’ll pay them off with the equivalent of a Major Reward taken from their winnings. There are two main options for resolving the matter. Destroying the enemy would win the support of one’s “ally” Krocylean kingdom. Seizing control of the nexus and repairing it would bring peace to the island in a less bloody way. In either case, there would be commensurate rewards. Destroy the enemy. They could launch a full-scale assault on the other kingdom, seeking its surrender or annihilation. (The Shadow Isles sees little difference between these options. The Freljord would, of course, prefer surrender over destruction; Ashe isn’t about to start ordering a mass slaughter. It would nonetheless be an exceedingly bloody affair.) Each kingdom is Strength 60 (Epic). A Major Espionage check can be used to assist. Seize the nexus. They could instead attempt to take control of the central city and its nexus. The monarchs seem less pleased by this option, making vague remarks about the city being “indefensible” and recommending a full-scale assault on their “evil” counterparts. Repairing the Nexus would be an Epic Research challenge, with a Major Industry check to assist. Neither side shows any interest whatsoever in a truce, even one limited to allowing the Valoranians to attempt to repair the nexus. Pressing the matter prompts paranoid accusations against the Valoranians. That said, both the Shadow Isles and the Freljord will be given a choice to “walk away” and leave the island be. Both Bilgewater and Ionia will be given an opportunity to support one side or the other, or to support neither side, if this should turn into a battle between (Valoranian) factions. (They’ll also be given a choice as to which side to support.) They will want to be rewarded with the equivalent of a Major reward if you prevail, taken from your “winnings”. Champions (up to three each). Champions sent in this way will be added to the roster for the matches between the two factions if a battle occurs. There is no vote as to whether or not to accept help from another faction here. It’s a good idea. It’s a very, very good idea. Your Champions will call you stupid if you even suggest refusing help. As discussed above, there is also a chance that either Ionia or Bilgewater will assist you. They may have preconditions as to which strategy they will support. If your would-be ally insists on destroying the enemy kingdom and taking the whole island, would you endorse a change to that strategy to secure their support? What about if they insist on seizing the nexus instead of destroying the other kingdom? The choices above may give rise to conflict or cooperation between the Shadow Isles and the Freljord. If the other faction attacks “your” kingdom, will you defend it? Note: there is no fortification bonus. If both sides attack the other, the clash will happen in the open between them. If the other faction tries to secure the nexus, will you cooperate? If both sides cooperate, they’ll work together to hold the nexus against the two enemy armies. (Again, no fortification bonus.) They’ll then each get an independent shot at solving an Epic Research check to repair the nexus. If necessary, will you fight the other side for control of the nexus? (If you both cooperate, this is irrelevant. But if one of you does not cooperate, the question is whether the other side will abandon the nexus or fight to hold it.) Note that, if the other side runs off, it’s likely that the Krocyleans will be too busy fighting each other to bother you. As a Summoner, you surely know how the Rune Wars happened. You put people in a situation where they really, really wanted to win, and then put the temptation of great power at a great cost within their reach. Things get surprisingly ugly surprisingly fast. Surprise! There may be a fierce battle between factions here, with a broken nexus nearby. Your Summoners could tap into this dangerous energy and use it as a weapon, through the use of a very-nearly-illegal spell that’s about as close to Rune Wars magic as you can get without being thrown out of the League. (This is so regardless of where the fighting happens: these spells have long range.) This would do significant damage to the enemy and run a significant risk of a disaster. I promise you that I have written down rules for how this works, but I’m leaving it intentionally vague here for the sake of realism. It’s more likely than not that unleashing this kind of force will have some harmful side effect. It’s unlikely that it’ll be anything world-breaking, and virtually certain that it’ll be confined to the island. (If you persist in asking your faction’s other Summoners for an overview of the risks, they’ll just give you the Chaos Theory talk from Jurassic Park.) There is a small but real possibility of a Void rift or something else equally awful. Again, probably confined to the island. Probably. Most likely. Unless…well, no, that couldn’t happen, the etherspace is too polarized. Right? Right. Definitely confined to the island. Definitely a small risk. Fighting each other, in itself, won’t particularly annoy the League. This might. (If all goes “smoothly”, the League will likely look the other way. If things go badly, there will be repercussions: loss of Favor, possible sanctions.) On the other hand, it’s all but guaranteed to do serious damage to your enemy and improve your odds. If you receive help from an ally, they will neither have any say over this decision, nor share in any blame that may result. Here are a few notes worth highlighting. The Shadow Isles summoned Aatrox. Here are his rules. The Darkin’s assistance comes at a steep price. Aatrox will be considered their gained champion for the week. it also may not support or oppose another faction’s petitions this week. If only one faction attempts to recruit Aatrox in a given week, it automatically gets him; if more than one faction attempts to recruit him, the faction with the highest vote percentage for recruiting him gets him. Whoever does end up recruiting Aatrox instantly loses two-thirds of its Favor. (This penalty takes effect before its petition is processed: it will be hard to convince the League to do anything while you bring the avatar of war under your banner.) All Favor gains for the remainder of the arc are cut in half. Finally, the faction’s Danger Level is doubled. “That is one costly top-laner,” you say. First, it is worth noting that these costs are less severe for a faction that is already down-and-out: it likely has little Favor left to lose. Second, Aatrox has a reputation for a reason. For the remainder of the arc, the faction rolls twice and uses the higher roll for all violent, military-related, or otherwise warlike options in lore events, islands, and the like. As for actual battles, Aatrox allows the faction to roll twice on the d6 random Strength modifier and use the higher result, increases the faction’s overall Strength by 20%, and inspires defeated units (lost, driven into retreat, etc.) to fight at full strength for the remainder of the battle. Both sides decided to use dangerous rune magic—the sort of thing the League was founded to prevent. This magic had the following rules, excerpted here in relevant part: “Deals 3d20 damage to enemy (“enemy” meaning the combined enemy army) as instant casualties in the first round of combat. Ignore Champions for this purpose. Instead, each enemy Champion on the field needs to make a 4+ save on d6 or be instantly lost and MIA’d for one week. (The runic surge hits them especially hard, because of their Champion mojo. )” There was also a d10 table for additional effects. The Freljord rolled a 1, because it seems someone always rolls the worst possible result in these types of situations: “Explosion hits both armies at full strength, all Champions check on 5+; otherwise as described above. Void rift bursts open. Both sides must flee. Island overrun by Void monsters. Lose 80% of Favor or 80 Favor; sanctioned. Island goes to League jurisdiction.” The initial rules simply called for both sides to flee. With how roided out the SI army was, though, we decided to allow them the choice to stand and fight if that’s what they want. See below. A match was held between the Freljord and the Shadow Isles. (These sorts of matches do not represent actual matches on the Fields; they’re just a way of using the game to help influence how the battle goes.) I wasn’t able to be around for more than the first few minutes of that, but I’m told that the Freljord and Ionia defeated the Shadow Isles. However, they were struck by an enormous backlash from the rune magic, and they were seriously outnumbered to begin with. This is not an army. It’s more as though a huge number of alien monsters were just released in the middle of the island. (Well, actually, that’s precisely what it’s like.) It’s not the start of a Void invasion of Nyroth, let alone all of Runeterra. Nor is this an apocalypse. Summoners are almost certain that they will be bound to the projection radius of the subnexus, which essentially ends at the coast of Krocylea. Even if they weren’t bound, they wouldn’t want to leave that energy source. Here are some relevant points about League law. Rune Wars magic is banned. This is, arguably, the entire raison d’etre for the League: when big powers get fighting, sooner or later (here sooner) someone reaches for the large-scale battle-spells that destroyed Nyroth and nearly destroyed Valoran. There is no perfectly clear definition of “Rune Wars magic”, and there is some gray area; the Council follows a “we know it when we see it” approach. The one common element is that most of these spells involve manipulating leylines. (A rare few instead involve tapping into the Void or some other extradimensional plane; e.g., back in the day, Demacia did a lot of damage by invoking Celestial magic.) Breaking this rule results in stiff penalties, at the Council’s discretion. Fight whomever you like on Nyroth, just keep it quick. The League will frown upon inter-factional violence, but will not issue sanctions in most cases. In this situation, all four factions are perfectly free to massacre each other: that’s none of the League’s concern, except inasmuch as it leads to Rune Wars magic and other collateral damage. Bilgewater decided to support the Shadow Isles, while Ionia decided to back the Freljord. Mordekaiser took command of the armies of the Shadow Isles, wielding the iron gauntlet Elise had wrenched from the corpse of the tyrant Kaius after slaying him in single combat on the island of Neritum. Its power filled the Krocylean army marching with them with renewed ferocity; they forgot their fear. He ordered his Summoners to draw a summoning circle with the sigil of Aatrox carved in the center. As the storm clouds gathered overhead, he caught a lightning bolt with his mace and slammed it down into the circle. A tremor shook the island, and Aatrox appeared. The Summoners of the isles fell on their knees and swore their loyalty to the avatar of war, who pledged to lead them to glory. One particularly bold Summoner raised his concern that Aatrox, not having sworn an oath to the Shadow Isles in this dispute, and with his name not yet recorded in the League’s roster-book, could provoke sanctions by crossing the line into Nyrothian land. The Institute of War should be notified. Aatrox swept his sword high and spoke in a voice that carried across Runeterra. I AM WAR. THE MURDER-KING HAS CALLED ME TO NYROTH. ON FELL WINGS I COME. Aatrox conjured forth an ancient tome, taken from the sealed archives of the Institute of War, its cover splattered in the dried blood of those from whose dead grasp it had long ago been pried by agents of the Council. He hurled the heavy book into the chest of the doubting Summoner. The cursed pages were saturated by the death-screams of those who had perished by its dark magic over centuries of Rune Wars, and the impact loosed them in one deafening shriek. Over this din spoke the Darkin, Aatrox. CLASP IT TIGHT, O SUMMONER OF THE INSTITUTE OF WAR. YOUR KIND ONCE KNEW WAR. TODAY YOU SHALL KNOW IT AGAIN. Meanwhile, Ionia came ashore and joined with the Freljord. One Ionian Summoner gave a Freljordian colleague a jab in the ribs and said, “Well, we missed Shurima, so it’s about time, eh? Eh?” Her jest was not regarded favorably. The Freljord made plans to march for the central nexus, with the intent of securing it (alone or with the assistance of the Shadow Isles) and restoring the island to its pre-cataclysm state. Those plans were hastily called off when Ashe’s scouts returned, and confirmed their suspicions that the Shadow Isles had not summoned Aatrox to help them establish a defensive perimeter around the nexus. “Their” Krocylean king came running to Ashe, telling her this was proof of what he had told her, that the other kingdom was the manifestation of all their darkest and most hateful impulses, and that this darkness had infected the Summoners of the Shadow Isles. He asked her to make a stand against this horde. While skeptical of his metaphysical claims, Ashe declared that the Freljord would establish a defensive line and attempt to break the Isles’ advance. If the Isles took this kingdom, she knew, its inhabitants would not be free from their life of battle and conflict, but would rise again as undead slaves to Mordekaiser’s war machine. The Isles had to be stopped here. Soraka, leader of the Ionian expedition, vowed to do all that she could to hold the army of death at bay…though, looking skyward, she said the stars held no promise of success. Ashe had given Lissandra one dark command before Soraka and the Ionians had arrived. She had heard Lissandra speaking quite speculatively over the past several weeks about the possibility of using ancient Frostguard rune-magic to control the power flowing through Nyroth’s leylines and nexuses. She commanded her to use that knowledge to tap into the wild energy of the nexus and use it as a weapon against the Shadow Isles. Lissandra warned her that her studies had only just begun, and that this would be most dangerous; Ashe sadly assured the mild-mannered, cautious leader of the peaceful Frostguard that Mordekaiser’s armies were more dangerous still, and that she would rather answer to irate League bureaucrats than an army of the risen dead. Lissandra pledged to do what she could. The two armies met in battle, with Bilgewater remaining off-shore in a neutral position. The Shadow Isles invoked forbidden magic from the days of the Rune Wars to wrench a leyline loose and demolish the kingdom’s high walls. Thousands perished beneath the crush of stone and iron battlements as they collapsed. As the skeleton hordes swarmed through the breach, Ashe nocked an enchanted signal arrow and shot it across the sky, alerting the Frostguard mages surrounding the nexus that they were nearly lost. One of Lissandra’s Summoners cast the spells as Lissandra urged him that it was not yet ready. The nexus fractured, and a column of silver light shot up into the clouds. The Summoners beside Ashe felt their powers unimaginably increased, and instantly struck down Mordekaiser and two of his Champion lieutenants—Elise and Evelynn—with bolts of reality-rending force. They did not realize that every spell they threw tore the life out of hundreds of their own allies, who fell lifeless to the ground in heaps as they hurled spells to destroy swaths of Mordekaiser’s army. As one horrified Frostguard Summoner would later report the news to Ashe, the spell flew out of control. Lissandra threw herself bodily in front of the poor fool who had invoked the spell prematurely, seeking to protect him with her magic. She failed, sadly; he was killed instantly, his very soul torn apart by the terrible energies he had unleashed, while Lissandra was rendered unconscious, seemingly comatose. Aatrox himself landed atop the ruined castle walls. At his command, a skeletal dragon which had been circling overhead dove down into the center of the Freljordian resistance, and filled its jagged-toothed maw with bodies alive and dead. As its jaw closed and its victims’ blood poured from the gaps between its bones, Ashe gave the order to retreat. The Freljord’s armies fled to their ships, carrying Lissandra’s unconscious body with them. In the distance, they saw the nexus shatter and the dimensional fabric burst open. They tasted the nauseating tang of Void magic, and reality warped beneath their feet. Thousands were swallowed up by the melting, thrashing, contorting ground. Voidlings and other monsters from beyond came through the portal and immediately charged after them, eager to devour them. This was going to be hard to explain to the Council. So, Freljord (like the Shadow Isles) chose to invoke forbidden Rune Wars magic, and (unlike the Shadow Isles) rolled a critical failure. This triggers a localized Voidpocalypse. Let me emphasize that: localized. This will not spread beyond the island, and it will end one way or the other tomorrow (Friday). This is not another Shurima. As for in-universe perspective, it’s reasonably clear (as clear as it can be when talking about the Void) that this is a local phenomenon, naturally bounded by the energy sphere of the nexus. Still, there’s a lot of power to be had on Krocylea, and there are quite a lot of people (the native Krocyleans) who are going to die if the Void wins. Although this is not another Shurima, and that bears repeating—this arc has not just become another Void arc—this is a climactic moment that brings to a head many of the themes of alliance and rivalry between the factions, so I think it warrants a second vote. I’m getting my popcorn ready. This could be pretty freaking metal. Bilgewater, Ionia, and the Freljord joined the Shadow Isles and the Krocyleans in a battle against the Void. I simply do not have the words to describe such an epic clash at the moment; suffice it to say that the monsters were slain, and the portal was closed. Aatrox was not finished. As the Freljord fled back to their ships, the Shadow Isles turned on the Krocyleans. Ionia’s armies, led by Soraka, valiantly formed battle lines with the Krocyleans and defied the Isles to attack. Bilgewater retreated to its ships, but readied their ordnance. Attack the Isles did. And as for what happened next, well, that remains to be seen. You can read the GDoc with all the details of the rolls and such here. This will obviously call for a somewhat fancier resolution than usual. That will be coming eventually. For now, here’s a link to an overview. Ionia and the Freljord, together with the Krocyleans, were on the brink of defeat (and slaughter) when a devastating flank-charge by Sejuani’s boar riders broke the Shadow Isles’ advance and turned the tides. Though they took catastrophic losses, they succeeded in banishing Aatrox and reclaiming the island. They re-aligned the nexus, just in time for the Council to show up (with a combined Demacian–Noxian peacekeeping force) to tell everyone to GTFO. where there matches between the factions? how did they go? The Freljord and Ionia beat SI, I believe. What did them in was the Rune Magic backfiring. I’ll update to add some clarity. Any chance of recruiting some help from Zaun, whose first hand experience in closing void rifts and void magic in general might be able to stop some of the damage? Hasn’t Bilgewater after all finished a Warpgate on Nyroth? well SI kinda gave up trying to care about the opinion of others i think. Oi, Zaun wasn’t even here. But guess who Freljord is allied with…DEMACIA. I CALL FOR SANCTIONS ON DEMACIA FOR TEACHING THE FROST PEOPLE HOW TO SUMMON VOID PORTALS! What about the Gauntlet that SI gained in Neritum? Shouldn’t that be giving us a military boost? This is really interesting. Funnily enough, it seems specifically tailored just for this type of event…but that’s probably at least a partial coincidence, as people had ample opportunity to take this, and the mirror image gave you guys a fairly easy fix. Oh man though, this is gonna be an interesting war…if it happens. Come on, we all know that neither side is just going to ‘leave,’ both militaries are at least NEAR perfect condition, and the Isles could care less about throwing units away (probably). Regardless, the biggest challenge here will be the cooperation. I don’t think there’s too much bad blood between these two factions, but who knows? Maybe Voli is still grumpy about those Ursine souls.